Manufactured Pre-Assembled Modular Tool Crib Sales & Installation Nationwide. 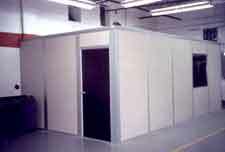 Modular tool cribs are one of the simplest forms of modular construction available. In their simplest form, these rooms simply cut off a small part of the factory floor, and are a walled in area where tools and other regularly used equipment can be stored. The rooms can be designed and installed to your exact specifications, the size of the modular tool crib is defined by the walls, and thanks to the modular nature of the construction, the actual size is subject to infinite variation, and can be specified exactly. For ease of installation, all of the construction work for modular tool cribs is carried out off site, and the wall panels are delivered fully prepared and ready to install. The actual building work is very quick and straightforward, meaning that the time taken between placing your order through to having the facilities available within your workplace is as short as possible. The needs of every business are slightly different, and because of this, the specifications of each modular tool crib are also unique. Some businesses use many larger tools, and will require more space in which to store them, while for other companies, comparatively few tools are needed. The design of the crib will need to reflect your exact needs, and it is important to set out the exact needs in terms of space and facilities in advance to ensure that things are right for your needs. Because the prime motivation for the installation of a modular tool crib is to protect valuable equipment from theft and loss, security should be a consideration during the construction process. 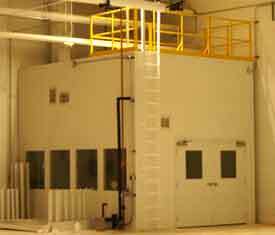 Easy Rack modular rooms feature 3 inch thick walls, and high security doors can be specified as part of the basic installation. Some businesses find it advantageous to incorporate a roof onto the room for added safety, while others deem it important to include space for a person to work within the room and sign out any equipment that is used. Your exact needs will define the room that you require, and for such an important security area, it is important to choose the best possible room to fulfill the role of protecting your investment over time. Easy Rack carries a wide variety of used pallet racks, commercial lighting, modular buildings, material handling equipment and offer installation & sales nationwide and much more . If you can not find what you are looking for call us toll free at 1-888-776-3720 and we will find it for you. Our home office is located in Houston, Texas.